Auxiliary verb used for making a strong, emphatic, or rude command form. 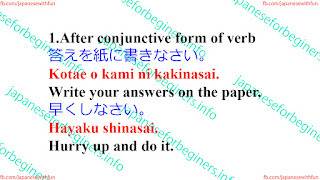 The standard negative command form is made by adding na to the dictionary form of verb. It is safer to use nasai only toward children. Adding yo after nasai will soft and the tone, however. Kotae o kami ni kakinasai. Write your answers on the paper. Hurry up and do it.